Home › Math › Thinking (back) about Trig? In the fall I will be teaching a section of Precalculus Honors at my school. I have not taught that course in about six years so I have not spent a bunch of time thinking about teaching trig functions for awhile. Our Precalc Honors class starts off with a study of Trig and I am thinking about an opening day activity that might plant a number of seeds that we will need to germinate over time. 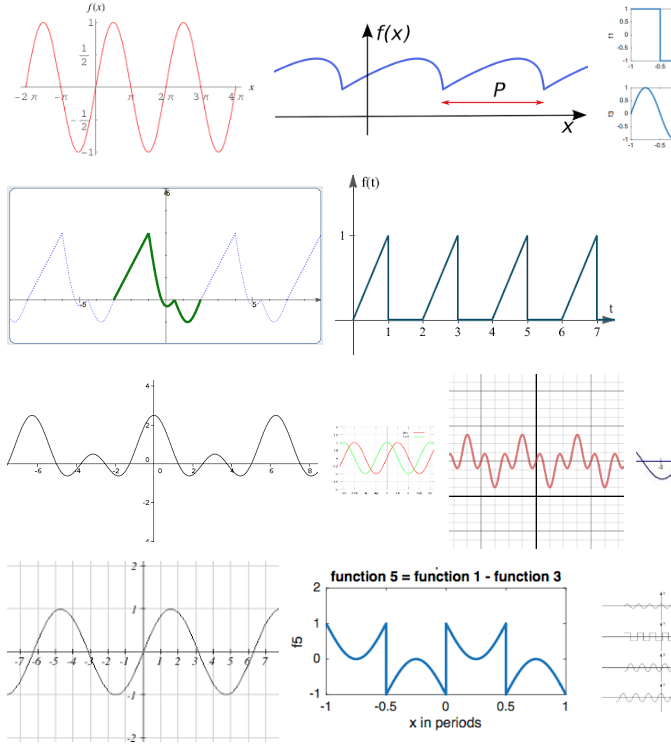 What strikes me right away is that there’s only one graph (the one at the lower left) that’s a straightforward trig function. That suggests a destination, but probably not a beginning. We want to start with data. Dardy offers various traditional ideas, such as number of hours of daylight, temperature, tides, all of which offer opportunities for periodic functions, and all of which are ones that we work with at Weston and at CSA. Oh — I promised to comment on what we did instead of this. Even though periodic functions are in some sense the heart of the course, we started with an activity that used triangle trig in a challenging way. The advantage, of course, is that it ties in which what the students did as freshmen in geometry. The disadvantage is that it was very different from what they would be doing in the coming months. Personally, I thought the disadvantages outweighed the advantages. ‹ Why do Asian-Americans excel at math?